Have you ever wondered why witches have green skin? People have different theories but we think it's pretty obvious. Their verdant pallor is from all those hours spent hunched over cauldrons. If you spend enough time stirring up boiling Jimsonweed, thyme, and toadstool there's a chance that your skin won't retain its natural hue. 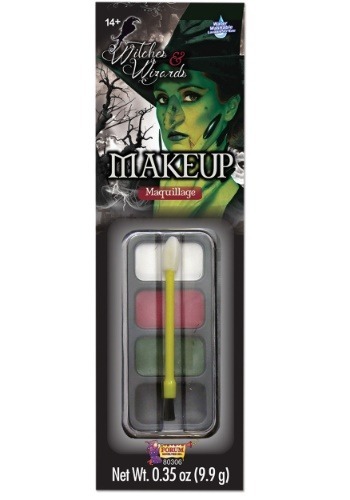 But, hey, that green look is something to be proud of when you're hanging out with your coven. What better way to show that you're on top of your potion game than lush, grassy colored skin? This makeup tray includes four different colors and a stick with a sponge applicator and brush in one. The colors include white, red, green, and black. Whether you're getting fancy with Youtube makeup videos or you want a simple green face with a black mole you'll be happy with your magical look. There are a lot of sweet witchy costumes out there these days. This makeup works for you whether you decide to don the classic pointed hat and long dress or you're shooting for something more trendy with a sweet little petticoat and sparkly spider accents. After all, we all know the best witches always have green skin!